The Concept of Food Combining is that bloating, gas, fermentation, and putrefaction can occur when foods with incompatible chemistry are ingested at the same meal or even too close to each in time. When you combine acidic foods and alkaline foods together, their chemistry neutralizes each other and instead of the natural enzymatic action being initiated, you got fermentation and/or putrefaction. Ripe Fruits (Alkaline) are eaten only with other Fruits. 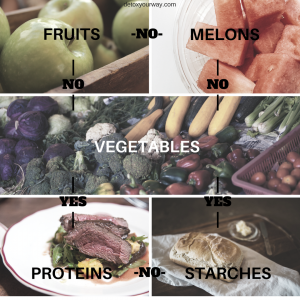 Melons (Alkaline) should not be combined with other types of fruit or food groups. Starches (Acid) and Proteins (Acids) do not combine well with each other. Starches (Acid) include corn, cereals, baked desserts, pastas, rice, oatmeal, etc. Proteins (Acid) include beef, chicken, fish, pork, dairy, eggs, soy, etc.